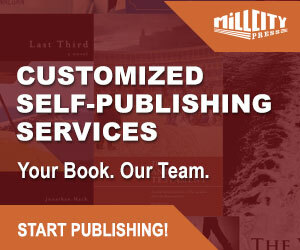 PressBooks is an online publishing tool that lets self-published authors and small publishers create professionally formatted book files for print and e-book editions. The completed files are compatible with all the leading DIY publishing platforms and print services like Amazon’s KDP and CreateSpace, Apple iBooks, Kobo, Nook Press, Smashwords, Lulu, and Ingram’s Lightning Source and IngramSpark. PressBooks is based in Montreal, Canada and the company was founded in 2011 by Hugh McGuire. He has been building new ways to merge book culture and technology since founding LibriVox.org in 2005. LibriVox is now one of the world’s largest libraries of free public domain audiobooks. He is also the co-author of Book: a Futurist’s Manifesto (with Brian O’Leary) and he helped to start the BookCamp conferences in Toronto, Montreal, New York and Melbourne. PressBooks has a small staff with various experiences in book design, e-book development, web design programming and marketing. … [in] building LibriVox I really learned that new Internet-enabled technologies can transform what “publishing” means. PressBooks grows out of this idea: that it should be “easy” for anyone to publish a book, which, no matter how many people read it, is always a hugely valuable creative experience for the writer. 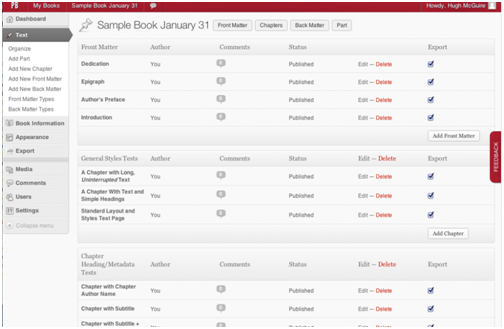 What I like about PressBooks is that it provides an option for self-published authors and small publishers to bridge a gap between manuscript and completed book file. It’s an area where authors (particularly authors new to self-publishing) can come unstuck when they attempt to tackle formatting for print and e-books across the various DIY publishing platforms. Sure, authors can seek the help of assisted publishing services, specialist conversion and distribution companies like Bookbaby and Draft2Digital, or they can work directly with a freelance book designer. Either way, cost can still pretty quickly run into hundreds of dollars, particularly if authors still have to make multiple changes or haven’t decided how their final books should look. 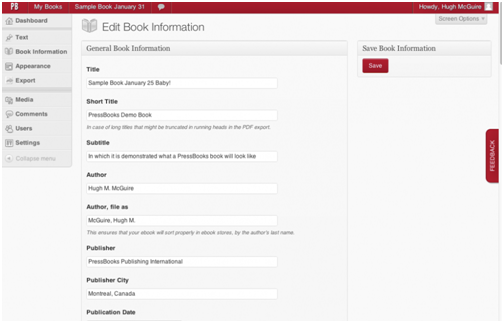 With PressBooks the authors are in complete control of the process. PressBooks bridges the gap between manuscript and final book by providing authors and small publishers with easy-to-use online formatting and design tools and it gives them the flexibility to take their completed files directly to a printer, or any publishing platform or retailer without the headache of having to worry about whether the files will be compatible with various different system specifications. You shouldn’t have to hire an ebook developer or a book designer to make a professional book. In the same way that platforms like Tumblr and WordPress made creating a beautiful website “easy” for regular people without any technology experience, we wanted to give that power to people making books. The registration process to create and activate a new account is pretty straight forward, requiring an email, username and password, and the web address of your book. Don’t be confused by the web address part. The sign up process simply prompts you for a name for your book’s web address. Your account with PressBooks is the book’s web address and piece of cloud real estate on the company’s server (*mybook*.pressbooks.com). Users will then be able to access their dashboard and begin the file production process. The first think you will notice is that your dashboard is a customized version of WordPress. This is the real intuitive beauty of using PressBooks and if you have a blog or website using WordPress already, then you will be very familiar with how many of the dashboard functions work. Even if you are not, it’s pretty easy to learn. The next stage is to add basic information about your book — author name, publication date, publisher, etc. You can also upload your cover at this point but it isn’t necessary, and likewise the various details can be changed before the book file is fully uploaded and completed. I should stress that PressBooks is both online writing software and a design and formatting tool. 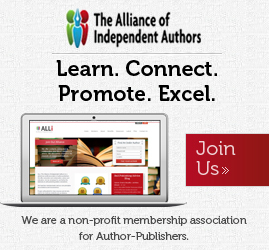 PressBooks is not a publishing platform, so you are of course free to use your own ISBNs and publishing imprint name. You control how the book looks, from front page matter, to chapter content, to end matter. The third stage of the process is requires you to add and organise the front matter, chapter styling and the end matter. This can also include such things like an introduction and preface; you can even add an index and bibliography. Again, the online tool is pretty flexible and you are free to test things and switch things around. At this point you should start to consider the overall layout and theme of your book. 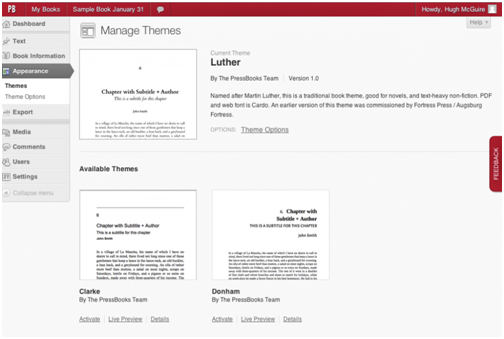 PressBooks comes with numerous professionally-designed themes, but it is worth remembering that whatever overall theme is chosen, it will affect the appearance of the completed book file you eventually export and take to a third-party service, including the look of your ePub, Mobi and PDF file formats. One of the more recent features added to the dashboard is the ability to upload Microsoft Word documents, as well as blog posts and CSS style sheets. Yes, if you have skills using CSS you can actually tweak the design features of your book! When putting your book together, you need to think of all the parts of your book (front matter, back matter and chapters), rather than trying to upload it as a complete document. I found this method worked best for me. Think of it like using Scrivener, only in the cloud. Each book layout theme has various options built into it which control various aspects of the finished book. I would suggest authors should try different themes to see what works best for their books while also taking the time to examine and tweak the sub options inside each theme. 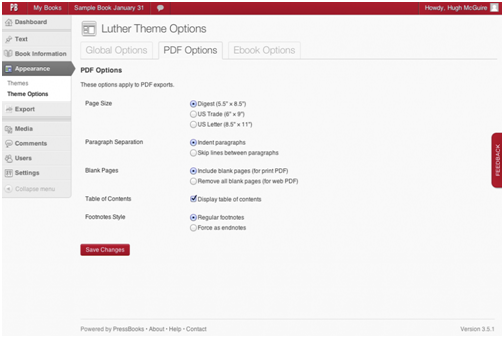 Once you have added all the contents of your book and decided on the layout and theme, you can then export multiple file output options (PDF, Mobi, ePub) including some additional handy file options like XHTML, XML for WordPress, and ICML for use with InDesign. Pretty neat! Now, while all this sounds great; there is a small kicker. Yes, PressBooks is free to use, but the exported files will include a PressBooks watermark. An author has the option to upgrade at a price to have the watermark removed. This price will depend on what export files the author wants. Alternatively, PressBooks also offers a Full-Service Conversion package. I should also note that there are some file storage limitations on some of the pricing options. In short, what you are paying for is removal of the watermarks, complete file flexibility, and the process and ease of file conversion. In addition, while PressBooks does support image-laden books, I really think it is much better set up for text-based books. If you have an illustrated book, you simply are not going to have access to the larger trim sizes suitable for these kinds of books. A DIY service like Blurb would be much better. Blurb is closer to Pressbooks — it’s really a book formatting tool, though Blurb’s focus is image-heavy, coffee-table books, whereas Pressbooks, though we do support images, is more focused on novels and nonfiction. 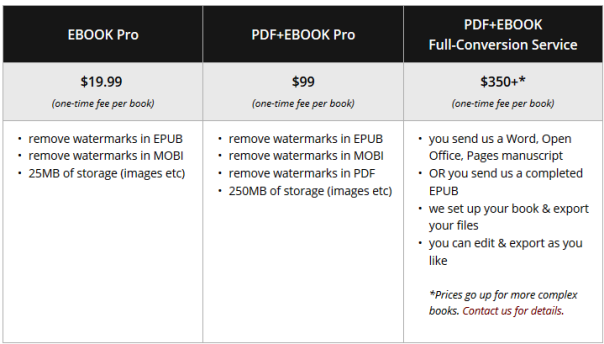 I think the e-book service is pretty reasonable ($19 per book), and a basic conversion for print and e-book files is also very good value ($99). Sure, other companies may match the $99 price, but usually this is only for an e-book edition and the conversion is still automated, sometimes with less than satisfactory formatting results. Yes, the offset of this is that the author is still doing much of the heavy lifting so-to-speak when using PressBooks and, crucially, distribution is not offered. McGuire did seriously consider offering a distribution option for the leading e-book retailers but has since decided to concentrate on what PressBooks does best for authors and small publishers. Some authors may prefer the free option of going directly with the various other retailers and distribution platforms like Smashwords, Kobo and Amazon Kindle/CreateSpace, but you will be dealing with multiple channels, repeating the upload process, and you will still have to create the template and design for the finished ePub, Mobi or PDF files (and trust that each channels upload/conversion process works faultlessly). There is a lot to like about PressBooks. Sometimes a simple idea proves the best idea. The use of WordPress as the base platform for the online book production tools was a very shrewd decision and it has resulted in highly intuitive and easy to use tools which any user can quickly and easily become comfortable with. The ability to be able to take converted e-book and print ready files to most other third-party publishing platforms is a real winner. 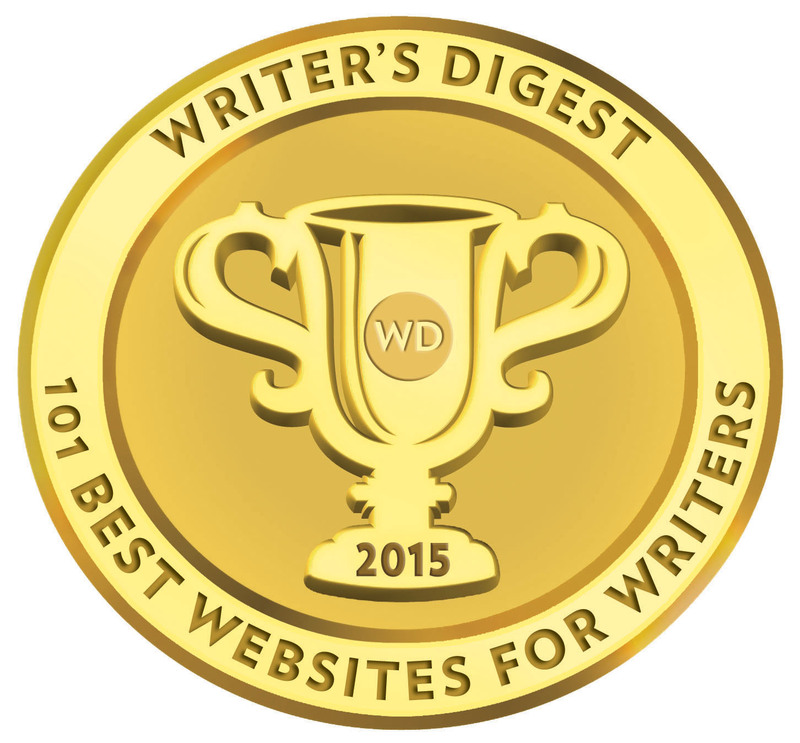 I can see why PressBooks is a serious option for self-published authors and small publishing presses. 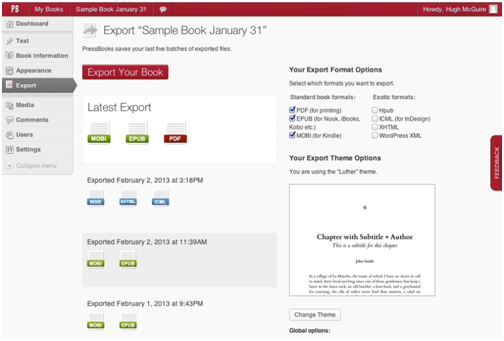 There is no need to invest in expensive book publishing software (or test out numerous freeware available) to achieve a finished and professional looking internal book file. But I think PressBooks has also missed a trick here, and along with the lack of a distribution option (there is a 10% discount built into the software for those users looking to use Bookbaby), the online tools only allow the upload of a completed book cover. There is no book cover design tool with PressBooks, which you will get with DIY platforms like Blurb and Lulu. If I am going to design, format and convert a book in the cloud, then I really want all of the processes of producing the complete book (cover and internal files) in one place. This is less of a concern for small publishers, but more of a concern for self-published authors. It’s that important icing on the cake which is missing here and might sway some authors elsewhere. One of the areas of concern I have is the support backup for new users. 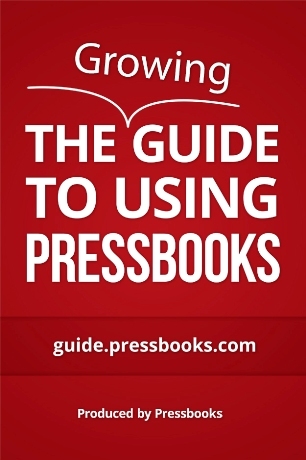 There is an online manual, referred to in several places on the website as An Incomplete Guide to Using PressBooks and A Growing Guide to Using PressBooks. Both are exactly what they say on the tin — incomplete and growing! PressBooks also has a support email so you can ask questions directly, as well as a user forum. Bizarrely, you have to create another new account to use the forum and this is filled with questions which reflect the incompleteness of the online guides already available. Actually, the best place to go for guidance on using PressBooks is the company’s YouTube Channel. This provides most of the answers to questions users might ask through video tutorials. But the website cries out for a complete video tutorial from start to finish explaining every aspect of using the online tools. While ultimately all the required information can be eventually found (partly across the online guide, website forum and blog posts), it’s damn messy and another reason why potential users of a great design and conversion tool for books will become easily frustrated and inclined to go somewhere else. 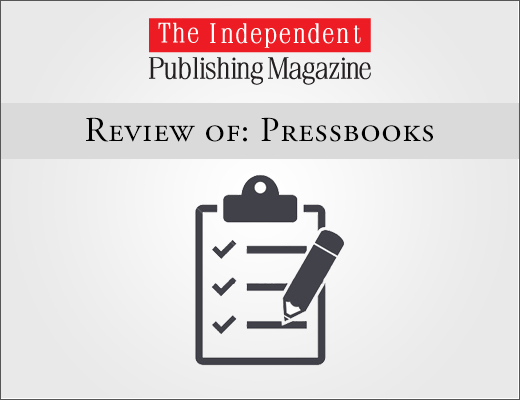 PressBooks is a classy, clever and affordable service for self-published authors and small publishers looking to take the pain out of producing professional and completed book files for use with third-party publishing and retail platforms (but with a few niggling issues). My rating reflects that Pressbooks is an online design and conversion service, and not a distributor and sales platform for books. I just used Pressbooks to publish two books. One a short story prequel and the other a full length novel. Both were a snap to do. Taking out the expense of book covers, I published BOTH books (one just eFiles and the other both print and eFiles) for under one hundred dollars. It just isn’t that hard to do either. They answered all my questions by email with satisfactory answers on the same day as I submitted them. My first published novel, while it is very well done as far as efiles and print files go, cost me over one thousand dollars to get the files completed. Never again. These new books look great and I am getting ready to use Pressbooks for my fourth book as well. I bumped into Pressbooks from Ingram Spark just today, and it looks very interesting for a ‘reworked’ title I currently have on CreateSpace. You *may* be slightly out of date regarding cover design (although I haven’t seen it yet, they say they have one in “beta”). My concern, right now, is there was no mention of handling CMYK images, rather than RGB ones – a requirement of Ingram Spark. I’ve sent a mail query on this but, somehow, given they have a link on Ingram Spark’s site, it must be ‘covered’ (I hope it’s covered!). Looking forward to delving in. So, as of May, 2018 ..does PressBooks have cover design option or not? If not, what is simple easy to use company-site that does?